While GTA real estate market is adjusting to Ontario's Fair Housing Plan, some of our clients are contemplating to start or expand their investment property portfolio in this more buyer-friendly environment. Recently, a young couple plans to purchase condos as long term income generating properties, we reviewed the market with them. 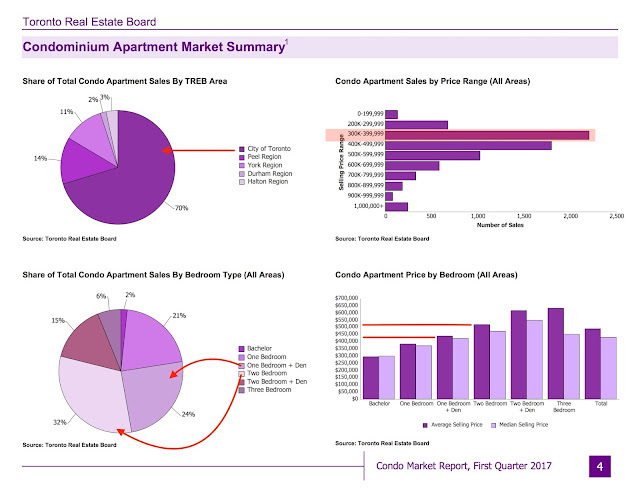 We thought many readers could be benefited with the condo overview data here. • More and more people are buying and living in condos - in the past 4 years, annual resales of GTA condo apartments grew 51% to 29,727 (2016), making up more than a quarter (26%) of all home resales. A GTA condos was sold at the average $416,252 in 2016. 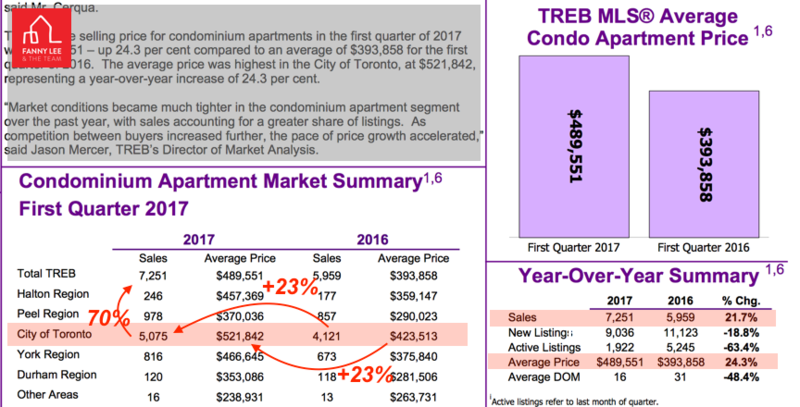 • Toronto dominates the GTA condos market - 70% of Q1 condos sales were of Toronto with an average selling price of $522k. • The most popular condo size was 2 bedroom - 2 bedroom condos contributed nearly 1/3 (32%) of Q1 sales , 1+1 condos made up about 1/4 (24%) of sales. As condo living is becoming increasingly common in urban Toronto, we will continue to share data and opportunities on this market sector. Should you be interested in any existing and pre-construction condos, please do not hesitate to contact us. Copyright FannyLee.ca 2010-2011. Powered by Blogger.